Running a blog/website or writing a book can become very overwhelming, there's so much to take in and learn and so much you have to put out there in order for it to connect with readers. So, what happens when we succumb a dry patch and writers block kicks in? Do what you love, spend time with the people you love, go on days out or just for a walk somewhere and try and brainstorm ideas in a quiet peaceful and tranquilizing location. 'Writing Challenge' really gets your brain working. It will give you a plot, characters, situations to write about and it times you.. it's fun and it really gives your imagination the kick that it needs. This really helped me and the stories I wrote using it, made me laugh uncontrollably. Weather that's pampering, gaming, shopping or whatever melts your marshmallow, make yourself feel good and feel happier by boosting your mood. When we feel good, we do good, but remember - less is more. Aim low! Weather that's watching you-tube stars, watching interviews of your favourite celebrities, scrolling through Instagram pictures, watching movies, reading books or watching your favourite TV shows. - I found that this helped me majorly and soon put the writers spark back into me. Okay, so we may not have the time to write a blog post every single day, but writing something everyday is important, I don't mean tweets or text messages here either. I keep a diary that I write about my day to day life in, it really helps to keep the flow of my writing up to standards. 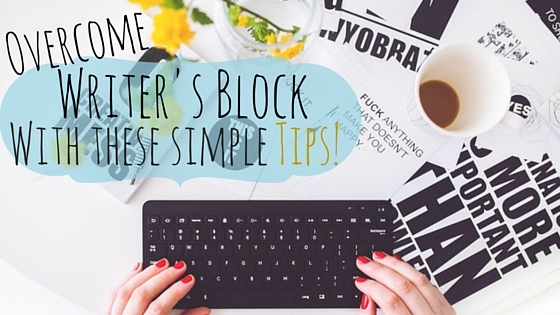 Reading blogs, books, newspapers or magazines is a great way to get rid of writers block. Don't just read, read between the lines, think to yourself 'How would I rewrite this article, what angle would I come in from, How could I change this?' you should soon have a lot of ideas running through your mind. Most Importantly, Write What You Know & Write For You! A blog is your online diary, you want to please readers, you want to have loyal followers, but the minute you stop writing for you and write for everyone else is when it will all fall apart. Write what you want to write about at whatever time suits you, If people are interested, they will read your post. Don't think your writing isn't good enough or that you don't have anything interesting to say and give up. Keep at it. Be original, bring something new to the table. It will work within time. Don't pressure yourself into writing if your not feeling up to it, the people reading it will know. Take a step back, cut off from social media and your blog for the day and come back to it when your ready. I took a big step back and spent months away from my blog. I deleted my original blog because I lost sight of why I was doing it, but I'm back and I have a clear mind and a new start. Time really is a great healer. Don't rush yourself into success, slow and steady wins the race. Have a 'big book of blog ideas' brainstorm all you can and write rough drafts out on paper before you even turn the computer on. Soon as you have your draft, your fingers won't stop clicking when you start to type it up and eventually you'll stop looking at the draft and you'll be writing it yourself. If these tips help at least one of you, I'll be happy. It is such a stress not only losing your ability to write, but also losing sight of who you are as a person and why you're writing in the first place. It's a rough patch to find yourself in but stick at it, never give up and eventually you'll find where your supposed to be.